is slightly lower at the start of the week. Currently, the pair is trading at 1.3302, down 0.18% on the day. In the U.S., the improved to 10.1, beating the estimate of 8.1 points. Later in the day, Canada releases the . This indicator provides a snapshot of business sentiment, and should be treated as a market-mover. On Tuesday, Canada releases manufacturing sales, which is expected to decline by 0.1% in February, after a strong gain of 1.0% in January. The Bank of Canada remains in dovish mode and may freeze rate hikes until 2020. The lack of activity from the BoC could weigh on the Canadian dollar, as the prospect of higher rates would make the Canadian currency more attractive to investors. Last week, the IMF downgraded economic forecasts worldwide, and Canada was no exception. The IMF lowered its forecast for the Canadian growth from 1.9% to 1.5%. The report noted that Canada would be a major beneficiary if the U.S. and China can hammer out a deal and end their bruising trade war. The IMF also lowered its forecast for global growth, from 3.5% to 3.3%. 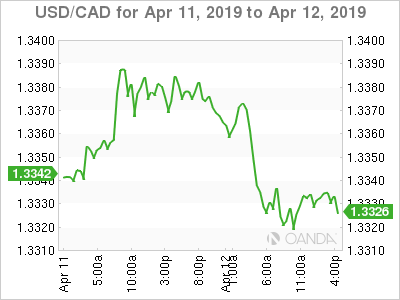 USD/CAD for April 11-12, 2019.